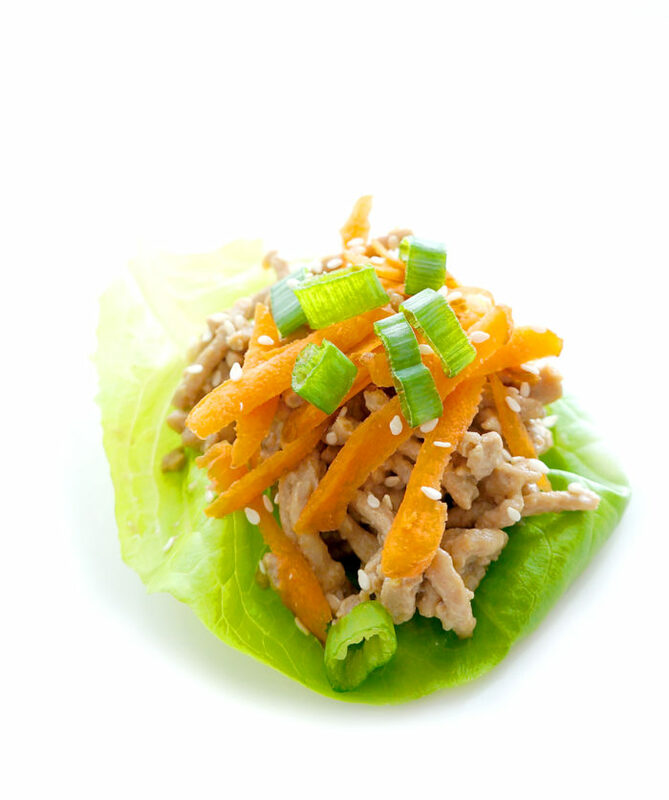 These Asian lettuce wraps are a tasty, filling and low carb option with only 100 calories per bite! The perfect little snack or appetizer to serve at your next party or gathering! 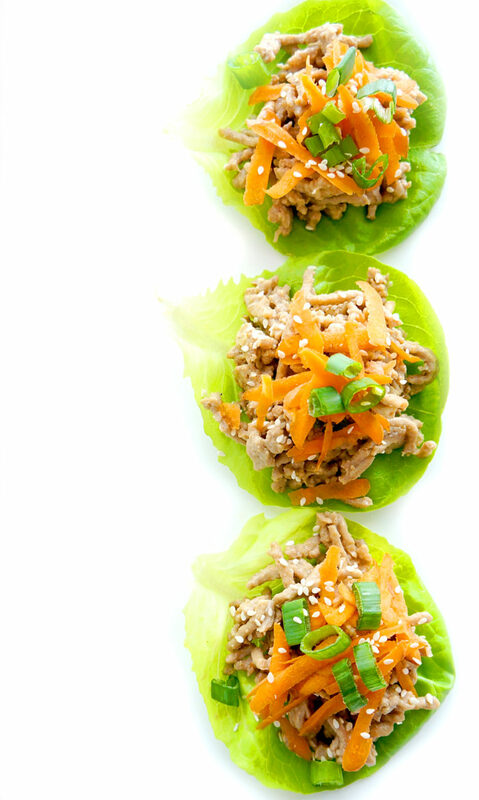 Next weekend is Superbowl and I can’t think of a better appetizer to serve than these lightened up Asian Chicken Lettuce wraps! Every once in a while I like to switch it up and experiment with different flavours and cuisines. My favourite is Greek (P.S. you’ve GOT to try out this Spiralized Greek Cucumber Salad?? SO good! ), but I also love experimenting with Asian flavours like in this Asian Quinoa & Edamame Salad. However, one thing I had never tried making before were lettuce wraps, so once again, I got busy experimenting in the kitchen! I couldn’t believe how easy they were to whip together and how cute are they served on this lettuce leaf? 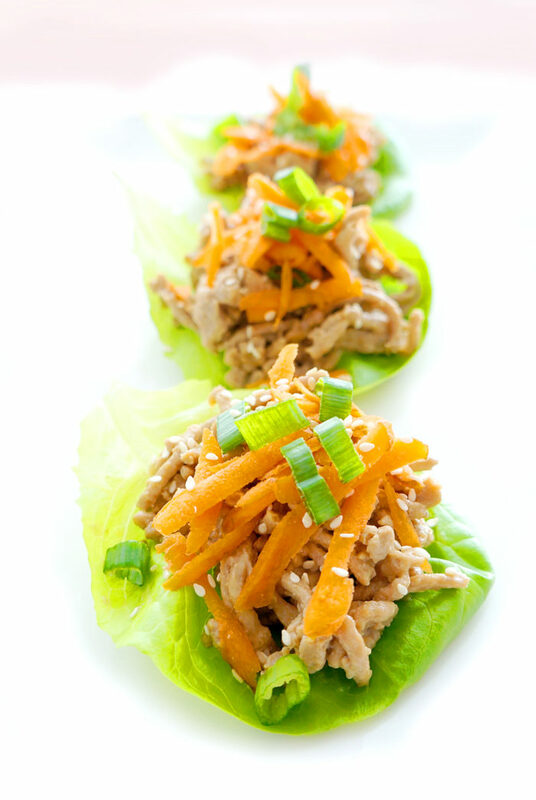 These lettuce wraps are also a great little snack to serve up to guests because everyone can assemble their own. Gotta love the DIY appetizers! What I love the most about these little bites of goodness is that they are not only delicious, but actually quite filling since they contain 8 grams of protein per serving. They are also super low carb, which will most likely be welcome with the carb overload often present at Superbowl. Think pizza, nachos, chili with a warm bun…yeah, you get my vibe. So start off right with some filling protein and fibre-filled veggies and you’ll be less likely to go crazy indulging on the not-s0-healthy options. In a small bowl, whisk together the first nine ingredients until well combined. In a large skillet, cook chicken and onion over medium heat for 6-8 minutes or until chicken is no longer pink and onion is tender. Pour the sauce into skillet and stir, cooking until heated through. To serve, evenly distribute chicken mixture between ten lettuce leaves. Garnish with grated carrot, green onion, sesame seeds and hot sauce, if desired. Fold lettuce over filling and enjoy!